Sam Rockwell as Sam Bell in Moon. On the surface, Duncan Jones’ new movie Mute is a singular thing. It’s a movie with its own characters, setting, and story. But when you’re watching it, you might notice something weird: A link to one of Jones’ other movies. And that was very much on purpose. 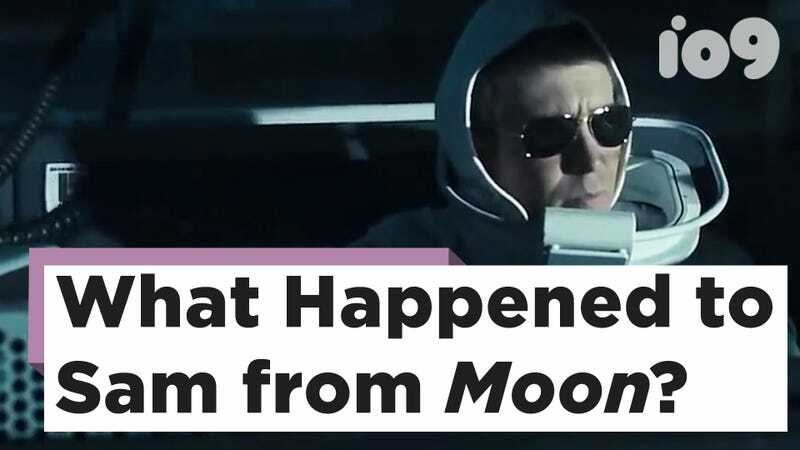 Two years ago, Jones revealed that not only was Mute linked to his first movie, Moon, but that they were but two stories in what he saw as a kind of trilogy. Now that the movie is out, we finally know what the link is. Below, we asked Jones about why he connected the films the way he did and what the status was on that third film. In multiple scenes in Mute, the main character Leo (Alexander Skarsgård) is near a TV. And on that TV is Sam Bell from Moon, played by Sam Rockwell. Sam made it back from the moon and has confronted his company about the cloning that allowed him (really, various versions of him) to be up there for so long. Below, Jones talks about that as well as the next film. We also asked Jones if we’d ever see the full scene of Rockwell playing all the characters, ideally in a way that’s not on a screen inside another screen. He seemed open to it. The problem is, with Mute on Netflix, he wasn’t sure when or where that would be released. But maybe that’ll happen at some point. For now, it’s nice to know that the story of Sam Bell is still raging on—while at the same time, across the Atlantic, Mute’s man who can’t speak is searching for his girlfriend. Mute is now on Netflix and Moon will be there March 1.